Now, beyond the content, I’m just worried about how it’s going to sell. I won’t go into it all again (that first link above has more detail, if you’re interested) but I ordered what I think should be plenty. I filled the large number of preorders I had, and now, assuming the normal level of extra interest this would attract amongst my regular customer base, I should have enough, unless everyone decides that they have to have the same specific variant cover and shun the other nine covers…then I might have a problem. Or if there’s a news story extolling readers/viewers “FOR THE LOVE OF GOD GO OUT AND BUY THIS COMIC,” in which case I’m totally not prepared. Well, we’ll see. Hopefully reorders will be available if necessary, because a $7.99 price point is a bit too high a price point to be taking a lot of ordering risks. I mean, do you want Just Another World War II movie, or do you want that? Or this? You’re reading this site, I think I can guess your answer. Or your other answer. So a while back I was told a new creator took over the Nancy comic strip, and when I looked then it didn’t do anything for me…but it’s starting to grow on me. I think it’s improving, actually, and this nicely Bushmiller-esque strip from the other day has been making the rounds. Granted, there’s something unnatural about Nancy and Sluggo referencing the internet, but then most of Nancy and Sluggo’s world is nightmarishly unnatural, so, you know, what else is new? My Swamp Thing love is so strong, the actual editor of the comic made sure I heard the news back in January. I am genuinely excited about this. You know how this works. Rows of panels, tall and narrow, keep them even, go as long as you need, break them up however you see fit. Superman – And that’s why I never go to a bodega after one AM. Batman – Hey, I saw you on the news the other day. Supes – Yeah, that happens a lot. Bats – Sure, but I noticed something weird. Supes – Uh oh. Here we go. Supes – Did the “world’s greatest detective” notice something? Bats – Didn’t your trunks used to be red? S – Alright, fine. Yes, they were red. I had red trunks on forever. And now they are black. It’s not my fault. B – It’s not you fault? B – I’m all ears. S – So I am flying around, nothing special, just checking out the city. B – I call it patrolling. S – Whatever. And I hear a mugging going down. B – You hear it. S – I hear it. Super hearing, you know. S – So I look around, and sure enough, back alley, a few thugs with knives, working some guy over for his wallet, yadda yadda yadda. You would have loved it. B – Hardy har har. B – I feel it was an entirely appropriate response to your statement. S – Anyways, I fly down, knife guys take off, and I’m going to follow them, except the guy getting mugged, he’s drunk. Wasted. Can hardly stand up on his own. Blotto. S – Isn’t that what the kids call it? B – Sure, why not. S – He was drunk. S – He kind of…. S – He throws up all over my trunks. S – Yeah. I’m none to pleased about it either. S – Vomit, all over my trunks. And he must have had some sort of throw-up superpower, because somehow, he got vomit only on my trunks. Not on my pants, not on anything blue, just the trunks. S – I’m going to stop you right there, because I don’t even want to think about it. S – Just then, I hear another mugging. It must be mugging night in the city. B – That’s the city for you. S – And I can’t be going off wearing this guy’s street pizza fighting crime. So I lose the trunks. B – You lose them. S – I drop them off behind a dumpster, and fly off to the next mugging. S – Well, no. The trunks go over my suit. But still, when I get there, I cover up with some old newspaper that was laying around. S – It was an alley, not a Fashion Barn. I worked with what I had. S – So I break up that mugging, go back to the scene of the first mugging, the guy is gone and my trunks are gone. S – My trunks. “Superman’s Trunks,” the sign says. And they are like, fifty bucks. B – What did you do? S – I bought them back. I had to, really. It’s not like super trunks grow on trees. But here’s the thing. They didn’t even clean them off. They still had vomit on them. B – Stuff’s amazing. Trust me, I run around in a cowl all night, beating up evildoers. Do you know what a cowl smells like after that? B – Burnt bacon and a trucker’s seat. S – No. Why? Why would you say that? B – Hey, you going to have that last pierogi? S – No, somehow I’ve lost my appetite. S – After all that talk of vomit and stinky cowls, how can you still eat? B – Hey, I’m Batman. Yes, a Spielberg-produced (I do not think he was ever committed to directing) Blackhawk movie was announced in the ’80s. Dan Aykroyd was set to write and co-star. I remember that STARLOG, or more probably its sister publication COMICS SCENE, ran an interview with Aykroyd about this. 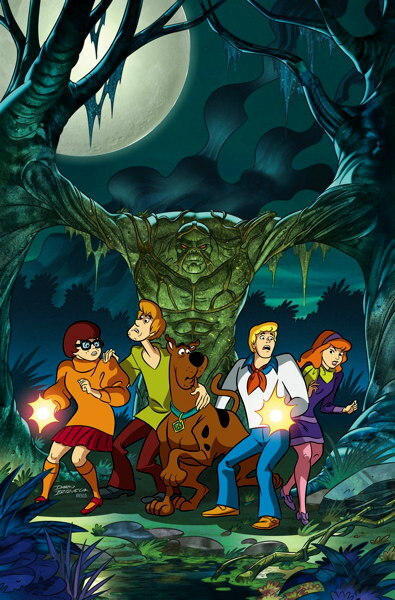 I remember three details from that: 1) it would have been set in the ’40s, 2) Aykroyd had not yet decided whether he would play Stan, Chuck, or Olaf, and 3) he had not actually written anything yet. I would not be surprised to learn that he never did. 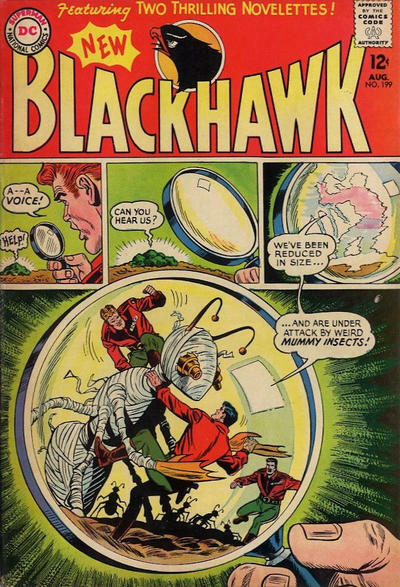 The movie never got far enough along that we heard anything about who might have played Blackhawk, but I wonder if Spielberg had someone in mind. This was during the period of his TV series AMAZING STORIES, and one of that featured a rising young actor named Kevin Costner as a daring WWII fighter pilot. It felt a lot like an audition. I note for those that are interested that the 1952 Blackhawk movie serial (which gives surprisingly prominent credit to Reed Crandall) is now on DVD. If you have never watched a serial, you should probably not make this one your first. It is best remembered for having one chapter end with Blackhawk’s car stalling on a railroad track, with a train approaching. Will he be able to get it started in time? The idea of simply getting out is never raised. I bought the “80’s” cover of Action 1000, since that was ‘my’ Superman. Nice to see the classic logo and DC Bullet again. My local shop had a hard limit of two copies per customer, since they got a LOT of attention today. They told me the “60’s” Allred cover was flying off the shelves and was the most popular by far. There’s an article on the Avclub commenting on the controversy over the new Nancy. Also, I want to thank you, Mike, for turning me onto the new Nancy strip — it’s so funny! How can someone smaller than an ant yell loud enough to be heard by a normal person? Yes, my suspension of disbelieve draws the line in odd places. James G: You’re going to need to sprinkle in a little more yiddish before I’ll believe that’s a Bendis script. Maybe at one point Batman falls on his tuchas?